The Wild Outsiders spent the weekend backpacking in the White Mountains bagging four more peaks on the 4,000 Footer list. This trip was planned out in celebration of our friend Fin's birthday. 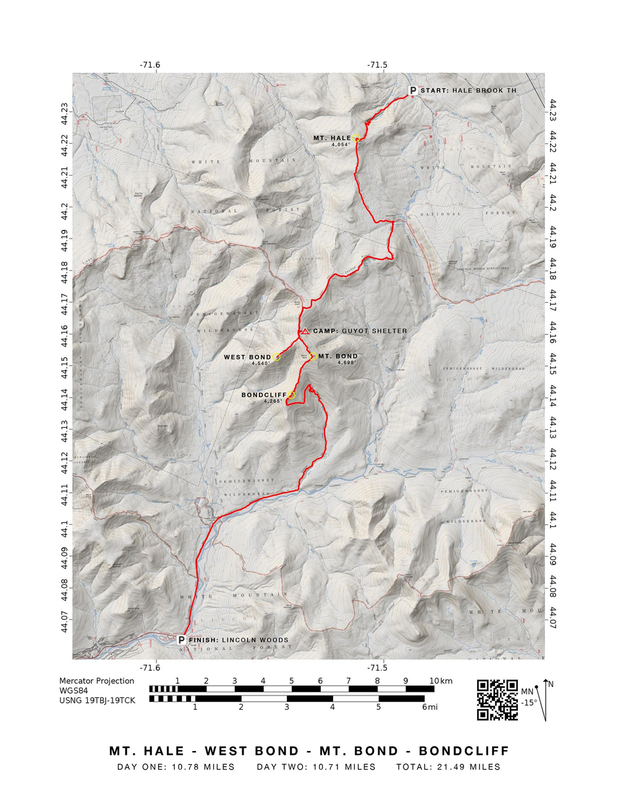 Having previously completed the 48 4,000 Footers of the White Mountains, he picked this hike for its spectacular views of the Pemigewasset Wilderness. The plan was to tackle Mt. Hale (4,054 ft.), West Bond (4,540 ft.), Mt. Bond (4,698 ft.), and the Bondcliff (4,265 ft.) in two days time. Teton drew up a plan and we headed out. The plan was to leave the Hale Brook trailhead early Saturday morning and hike to the summit of Mt. Hale. Mt. Hale was added to the itinerary for our sake so we could check the small peak off our list. Twirls and Finn met us in North Conway Friday evening for dinner. Afterwards we all slept in our cars at the Hale Brook trailhead after a starry-night birthday celebration. Saturday morning we woke up and cooked breakfast and made coffee before hitting the trail. Twirls and Fin cozy in the back of their car. The plan for day one consisted of a summit of Mt. Hale followed by a 2.8 mile hike to Zealand Falls via the Lend-A-Hand Trail where we would pit stop at the Zealand Falls Hut before hitting the A.T. via the Twinway Trail. The top of Mt. Hale. The short and gradual climb to the top of Mt. Hale was a good morning warm-up. When we got to the top we adjusted layers and headed out towards our next destination - Zealand Falls. Zealand Falls Hut welcome sign. 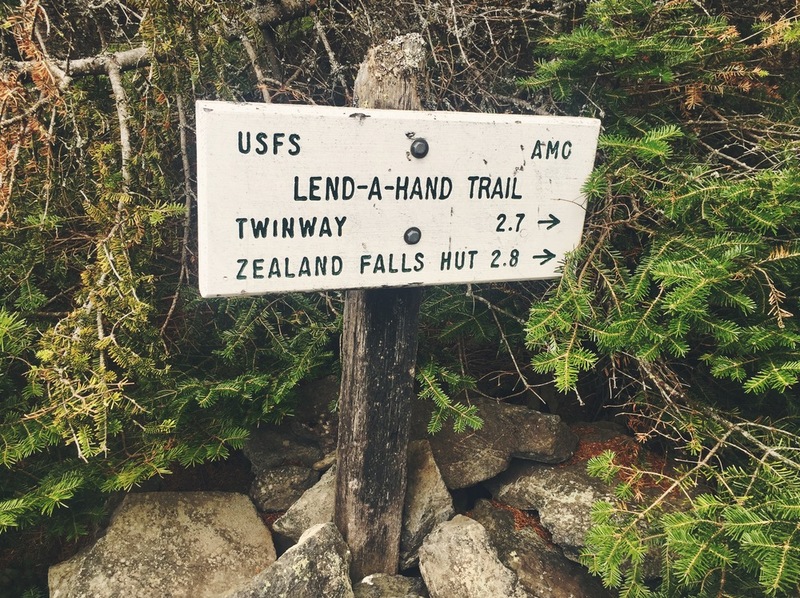 The Zealand Falls hut is only a .1 mile detour off trail so we decided to check it out. Having stopped at the Zealand Falls hut previously while on the A.T., it was nostalgic to be there once again. We filled up waters, used their bathroom facilities, and took a short break to have a snack and explore the interior. Once we were all refueled, we headed across the falls and jumped on the Twinway Trail (A.T.) and began our 3.6 mile traverse of the Zealand Ridge. Unbelievable views from Zealand Ridge's Z Cliffs. Teton and Moose on the edge of the Z Cliffs. We stopped for lunch at what would be known as the Z Cliffs, an amazing outcropping along the Zealand Ridge. This view point is a must see for anyone hiking the Twinway Trail, it offers an incredible view of the surrounding area and is a great spot to take a break. After lunch, we continued down the Twinway towards Mt. Guyot. Moose walks the planks along the A.T.
Fin and Twirls show off their surfing skills. 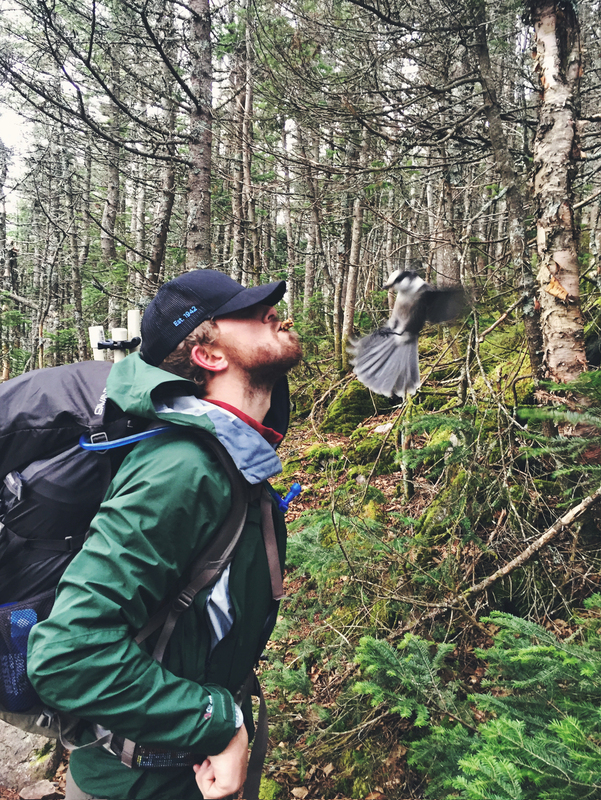 Teton knows it's wrong to feed the wildlife, but this Grey Jay stole his snack right from his mouth! Beautiful scenery everywhere you look! 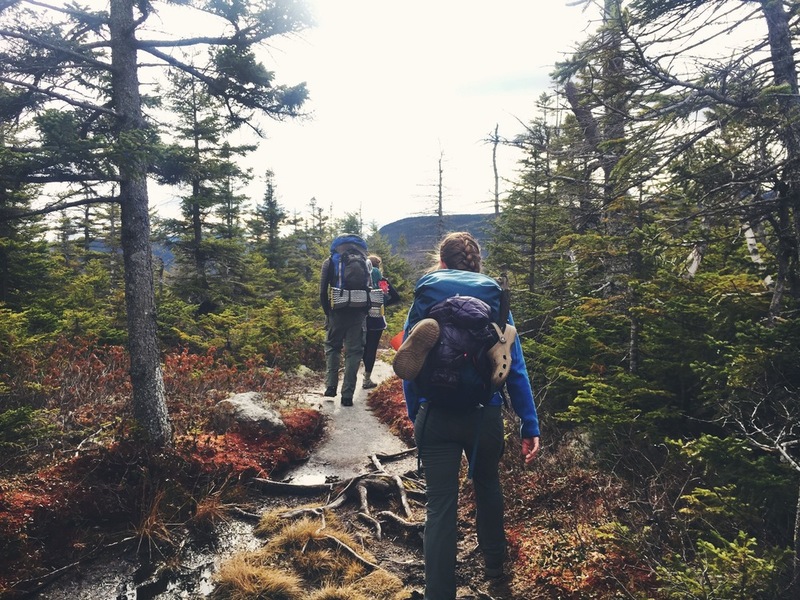 Trekking in the Pemigewassett Wilderness of the White Mountains. Top of Mt. Guyot, right on schedule. After 3.6 miles on the Twinway Trail, we turned off onto the Bondcliff Trail to head over Mt. Guyot and eventually towards our camp for the night the Guyot Shelter. Mt. Guyot is a subtle bald that offers a spectacular 365° view of the Pemigewasset Wilderness and the surrounding mountains. From Mt. Guyot our camp was less than a mile away, we headed down the mountainside to the Guyot Shelter and campsite where we set up our camp for the evening. As planned Fin's good buddy and hiking partner, Soul Man, met us at the camp. He had hiked in solo via a different route from Lincoln Woods. The plan was to meet up with Soul Man around 3 PM at the Guyot Shelter and then hike over to the top of West Bond to watch the sunset. The Guyot Shelter and campsite was unseasonably full, there were hordes of campers and hikers and the spots filled up fast. Luckily we arrived fairly early and were able to secure a tent pad. Be aware of this when good weather strikes; this shelter is accessible by fairly easy trails which allow many visitors to enjoy it. Blame the November heat streak! People who had planned to use the shelter arrived to find it filled to the brim and were forced to sleep outside, many with no shelter other than makeshift tarps. This is why it is always smart to carry a shelter no matter what! Our friends, Twirls and Fin, planned to shelter camp and were lucky enough to nab the two remaining spots. Soul Man was not so lucky. He arrived shortly after us with intentions of shelter camping and ended up having to use Fin's minimalist bivy that he packed for emergency. Soul Man joined us on the pad as well as two other late arrivals who had no other options for flat ground. The trail to West Bond was less than a mile and we headed out as soon as everyone had settled their camp and had a chance to have a snack. The clouds inhibited our view of the sunset a bit but it was none-the-less gorgeous atop the peak where we all hung out for an hour enjoying the views. Soul Man and Teton lifted Fin up in celebration of his birthday at one of his favorite places in the Whites..
Sunset view from West Bond. Once the sun dipped below the horizon, we hiked back to camp in the dark where we all gathered around our tent to make dinner. We hung out for a few hours drinking the beers Twirls and Fin had hiked in for Fin's Birthday celebration before hitting the hay. The next morning we awoke to a beautiful sunrise and a lot of snow! It dumped on us throughout the night and sufficiently covered everything in sight. It was a hard lesson learned for those who had to makeshift shelter outside. Soul Man faired alright since he had packed a heavy winter sleeping bag, but he too got covered in snow via the simple mesh covering on the face of the bivy. You never know what you will get in the Whites, never trust the weatherman and be prepared for everything! Even with the little sleep most of us got, we were all in high spirits! The fresh snow and cold air added to the beautiful surroundings and we all gathered on our tent pad to prepare breakfast. We all packed up after breakfast and hit the trail excited for the change in scenery. Moose makes her breakfast in the snow. Soul Man makes his way up the trail. A frost-bitten forest on the way up Mt. Bond. Teton at the top of Mt. Bond, the Bondcliffs sit below him in the distance. After summiting Mt. Bond, the tallest of this trip's peaks, we headed down to make the 1.07 mile ridge line walk to the Bondcliffs. Twirls makes her way to the Bondcliffs. The Bondcliffs were stunning! While the ridge line route to the summit is nowhere near as slim or harrowing as some other routes in the Whites it is equally exposed. As we made our way across we fought gusting winds of 40-50 mph, and multiple times we were pushed off trail by the winds. In one particular case, everyone was knocked to the ground completely. Soul Man at the top of the Bondcliffs! Teton helps Moose to the cliff's ledge, fighting the ferocious winds holding her back. When we made it to the top of the cliffs we were not disappointed. The 360° views were unbelievable and the rugged vertical cliffs surrounding us really made us feel like we were in the middle of nowhere. Moose makes her way down the mountain and eventually out of the snow. The remainder of the Bondcliff Trail post Bondcliff Summit is quite delightful. In comparison to most of the trails in the Whites, this descent is very easy and at about the 4 mile mark it actually follows an old logging railroad in classic rails-to-trails fashion. The final stretch back to Lincoln Woods is nice and flat - following the meandering Pemigewasset River through a lovely woodland tunnel. Walking the old logging railroad is a wonderful care-free way to finish this beautiful hike. Bridge over the Pemigewasset River right before hitting the end of our journey. 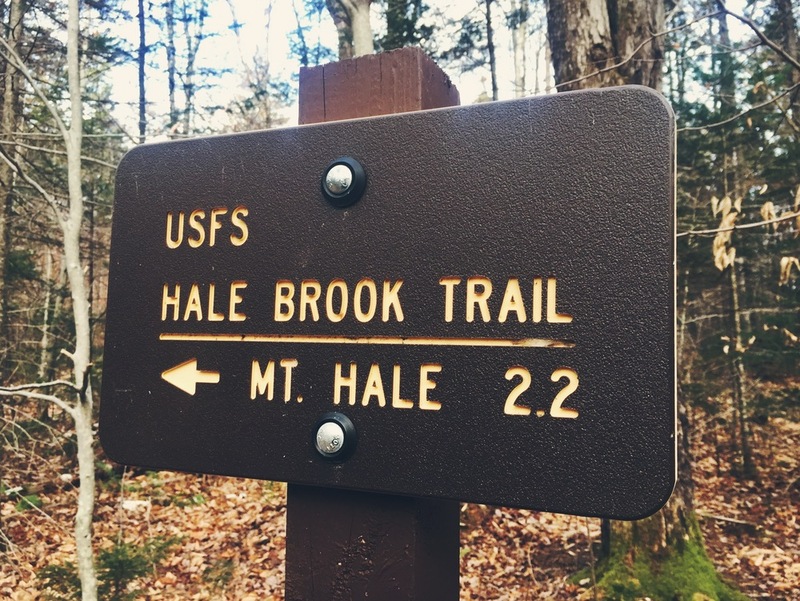 When we finally made it to Lincoln Woods, we all hopped in Soul Man's car and headed into the town of Lincoln, NH, for some dinner and beers before shuttling back down US 302 to the Hale Brook Trailhead.